History is evident of the fact that Muslim women have been portrayed as weak, submissive and dependent. On many occasions they have been denied basic rights like right to education, freedom to marry at their will, or pursue a career and much more. Additionally, they are mocked, abused and even beaten up, if they do not wear a headscarf, also known as hijab or khimar, and loose-fitting clothing, when they are in public. Moreover, some women are not allowed to show any part of their body to another man, except their eyes. They are forced to cover their face with a covering known as niqab. In my opinion, clothing should not be enforced on a woman. They should be allowed to dress up as per their will. I was inspired by a highly esteemed and renowned online art event called the “Muslima”, which aims to encourage cross-cultural dialogue about Muslim women, to break down barriers, to challenge stereotypes and to encourage understanding. It is an online exhibition of fine art, photography and writing from women around the globe that focuses on exploring the meaning of a Muslim woman in today’s world. It has been curated by a California-based novelist, artist and activist, Samina Ali, and organized and hosted by the online International Museum of Women. To fight against such barriers and stereotypes against women, Muslima experiences participation from many artists from around the globe. One such artist from Netherlands called Rajae El. Mouhandiz’s work really inspired me. She is a singer and artist leading the movement for Muslim women's representation in pop culture with her message of positivity, hope, and inclusion. She shares her brand new music video and talks about the challenges she faces as a Muslim woman artist, from both mainstream and Muslim media. Recently, she was labeled as the leader of the Muslim community. Soon, she portrayed herself as a leader wearing a long skirt and a top that carried messages of freedom. 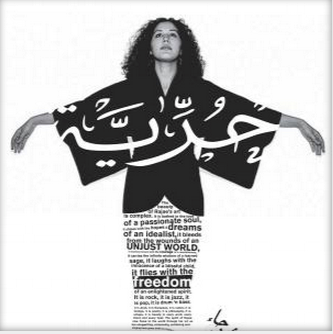 The top carries the message of freedom in Arabic, whereas the skirt has numerous rights that women are struggling for, written in English. The picture is available on her blog on muslima.imow.org. The picture uses black and white colour, and is just available in passport size on the web, that is, about 2”x2”. Her work inspired me as she has not only discussed the prolonged gender discrimination in the human race, but also has fought against it with modern weapons like pop music, art representation and online blogs. However, I was not really inspired by the way she has portrayed herself in the picture. She has denoted herself in black and white colour. These instead of calling for freedom, denote the bleak world of a woman. Moreover, it evokes some racial discrimination as she has written all English phrases with black, whereas she has used white colour to write in Arabic. As a viewer, I perceived that she is trying to convey that the English people discriminate against black colour and the Arabic speaking population discriminates against fair skin people; consequently, the black colour is asking for freedom in English, and the white colour is asking for freedom in Arabic. Lastly, she has shown herself with open arms, looking up to the deity. This just shows the submissive position of a woman. She is seeking help from God rather than fighting on her own. Also, the passport size image makes the English phrases and words very tough to read. I am an avid business student, and thus, due to lack of artistic expertise, I have used pictures to support and show the items in the portrait. However, I am highly interested in the artwork that aims to strengthen support for movements leading to women empowerment or call for equality in our society. Consequently, I analyzed Rajae El Mouhandiz’s image, and recreated it to help evoke right emotions in the audiences, and make them associated with her even more, since she has become a public image. I have used colours like green as it denotes peace, blue to indicate calm, optimism, and happiness, yellow to show intelligence, tenderness and fun, and lastly, red to represent vigor, vitality, and emotional aspects of a woman. All these interpretations are from Islamic culture, and thus, would help Islamic community across the world to associate with Mouhandiz. Moreover, I have made the image big enough to be seen clearly – 800mm x 585mm, unlike the original one. Also, I have created a contemporary artwork using leaf to denote the green coloured top. This depicts a fact that nature had created all human beings equal to ensure peace and equality. Further, I have shown Mouhandiz juggling between six roles* that a woman can play effectively in a society, but is not allowed to. For the legs, I have used two natural wood sticks. This implies that as the wood in the branch makes a tree stay rooted to the ground and bear the leafs, thorns and fruits, same way, women are strong enough to stand on their feet and carry the load of the worldly tensions as well as joys at the same time. 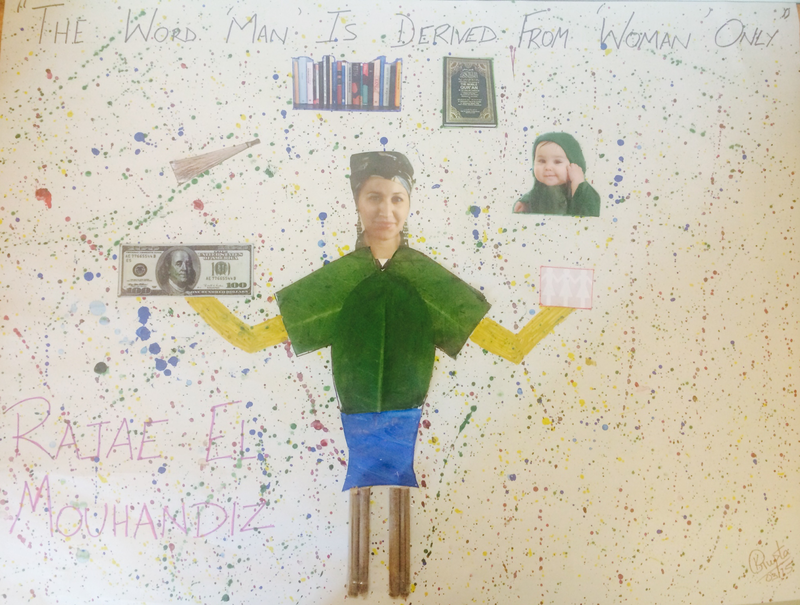 I have labeled this artwork as “The Word Man Is Derived From Woman Only”. This statement implies that women are the one who give birth to the self-acclaimed stronger men. So, in reality this makes women more powerful than men. From here on, I leave the viewers to ponder then that why does the society think the other way round? The original representation of Rajae El. Mouhandiz. Union. N.p., 29 May 2008. Web. 31 Mar. 2015. Times. N.p., 03 July 2013. Web. 31 Mar. 2015. "Rajae El Mouhandiz." MTV Artists. Viacom, n.d. Web. 27 Mar. 2015. Mouhandiz, Rajae El. "Mainstream Muslima." Mainstream Muslima. N.p., n.d. Web. Stoughton, Indian. "Exploring Life as a Muslim Woman." IndianMuslimObserver.com — India's First Online Muslim Newspaper. N.p., 13 Apr. 2013. Web. 25 Mar. 2015.